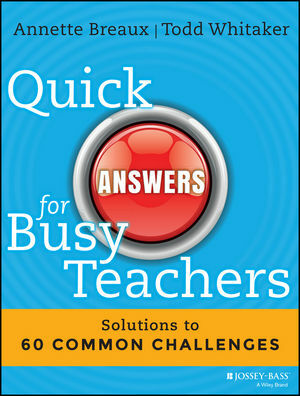 Quick Answers for Busy Teachers presents some of the most common challenges teachers encounter in the classroom, and provides expert help toward solving those problems. This easy-to-read guide is organized into short, discreet chapters, making it an ideal quick reference for on-the-spot answers, with practical advice and concise, actionable solutions. Readers will develop systems for dealing with issues that repeatedly crop up, from handling the out-of-control class to falling out of love with the job. The book offers innovative methods and techniques that improve student achievement and behavior while minimizing stress on the teacher. Recover from challenging situations with parents, students, coworkers, or administrators, implement a system that keeps those challenges from happening again, and learn to relax and enjoy this richly rewarding profession. Teaching is difficult. Educators must grapple with a roomful of diverse students, an evolving curriculum, massive organization of books, papers, and supplies, and ever-changing technology. They must deal with challenges from uninvolved parents, overinvolved parents, administrators, and fellow educators. This book helps teachers avoid some of the frustration by providing solutions for the sixty most common challenges teachers face. As a teacher, igniting young minds is only a small part of the battle – it's usually everything else that makes teachers occasionally reconsider their career choice. With solutions and systems in place ahead of time, readers can handle challenges swiftly and skillfully with Quick Answers for Busy Teachers. ANNETTE BREAUX is an internationally known author, consultant, and speaker. Her previous books include 101 Answers for New Teachers and Their Mentors and The Ten-Minute Inservice. She has coauthored books with both Harry Wong and Todd Whitaker. TODD WHITAKER, PHD, is professor of educational leadership at Indiana State University. A leading presenter in the field of education, he has devoted his career to researching effective teachers and principals. He is the author of What Great Teachers Do Differently and The Ten-Minute Inservice.